Calamity Co Dance: We're going to NYC! We're going to put on a show soon in good old New York with our lovely friend Julia Havard of Fresh Peach Dance. 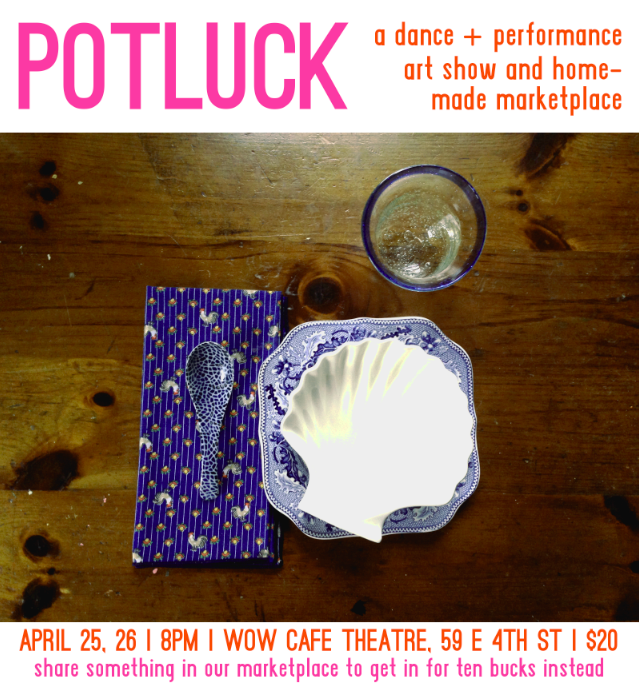 The show is called POTLUCK! And a potluck it will be. We're bringing a few snacks and drinks and a dance or two, a few of our friends are bringing music and dance and film to show, and we're holding a marketplace after the performance. Some friends are bringing art they've made for that, and we were hoping that some of you could bring some of your own homemade things -- maybe crafted, maybe edible -- to share, as well. (If you do bring something, your ticket is half price). We're very interested in looking at the fact that everybody has something interesting to say (or dance or sing or create in any way), and how to best share all those things with one another. Please come! It's going to be a blast. I'm pumped to see all these things and meet all these new people!